Baby sleeping at night means everyone in the family sleeps better. Having a baby that doesn’t sleep well calls for action. Our grandson cried non-stop every time he was laid down for months. At night one adult swaddled him, walked him, rocked him, and prayed for him to sleep. Whenever he nodded off, he was gently laid in his car seat (the only place he sometimes slept). Within a short while he was crying again and the whole process began again. He was finally diagnosed with GER and medication was prescribed and the whole family began to get sleep at night. Most babies don’t have such a severe problem with lying down and sleeping. 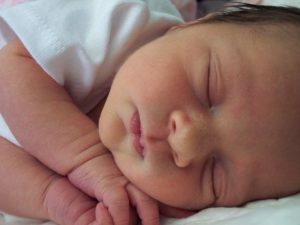 Here are some ways to help your baby be able to sleep well at night. Starting early might help you avoid some bad habits that will make your child’s falling asleep a chore every night for years. Wind down time. Right before nap time and bedtime, take a few minutes to snuggle and begin to calm down. At nighttime, you may want to have a longer bedtime routine including a soothing bath, read a book or sing a song, pray together, or any other ritual you don’t mind continuing for years. Comfort. Make sure he is fed and burped, has on a clean diaper. Swaddling helps young babies feel more secure. Appropriate sleepwear for your climate and room temperature is also a must. Sleep associations. Dim light, white noise, a certain scent, or a comfort item can signal it is time to sleep for your little one. Even when you need to give a night feeding, be consistent with keeping the lights dim, little noise, and no play during these feedings, your baby should learn to fall back to sleep quickly and not get his days and nights mixed up. Keep naps consistent. When babies are overly tired, they are much harder to get to sleep. As much as possible, make sure they have a regular nap time. Lay baby down before she is totally asleep. When she falls asleep in your arms, she expects to wake up that way. When she stirs and you are not holding her, she is jerked wide awake and alarmed. Then you must hold her again for her to calm down and get back to sleep. But, if she falls asleep in her crib with very dim light and quiet, she will learn to self-soothe to sleep. When she stirs awake later, everything is as it was when she fell asleep, and she self-soothes back to sleep. Of course if she is hungry or wet, she’ll let you know she needs your help. Babies don’t sleep through the night for the first few months. Most babies need night feedings until they are at least 12 pounds or 5.5 kg. By about 3 months, babies are fairly regular about when they eat and sleep. If you have practiced these routines, your baby should be well on the way to sleeping through the night. Gentle ways to help your child sleep through the night. If you have questions or comments about this article, please email me.